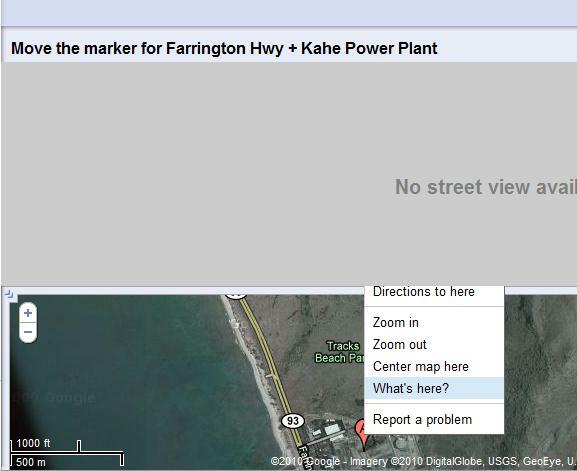 This week, I was assigned to an interesting task that searches for the longitude and latitude of some power plants in Oahu. Well, it looks very easy, but actually it is quite tricky. When I was trying to find something, the first thing come to my mind is to Google it. I went through these power plants' home page, but it is not easy to find the exact coordinate of the power plants (Because most of them only have an address for the power plant). 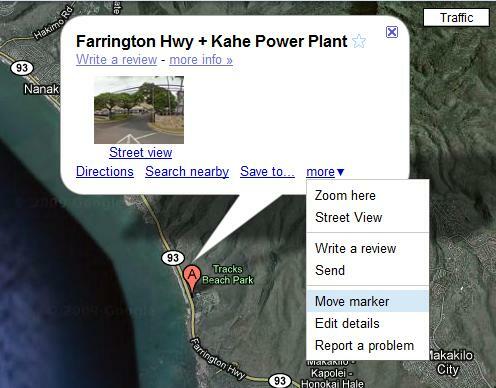 Then, I used Google Map to search the address that I just acquired. However, the longitude and latitude information was still not showing. At this point, I just played around with all the possible tools in the Google Map. Finally, I found a way to get a loose coordinate of a place. First you need to click on the marker and choose "Move marker" from the "more" drop down list. 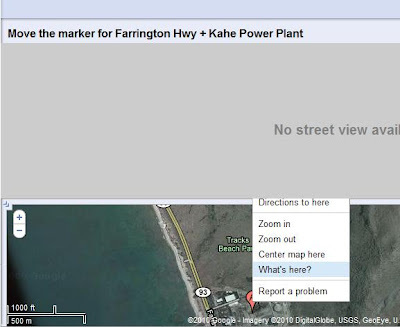 Then you may drag the marker to the place that you want to know the coordinate. And then right click on the marker and choose "What's here?". Then you may notice that the coordinate is displayed in the search box now. Although it takes some steps to get the coordinate, this is the easiest way I found so far. To make searching coordinate little bit easier, I created a Google Gadget that provides a drag-able marker that shows the coordinate of the marker. However, you need to know a loose coordinate of the place first. Anyway, here is the link for the location finder gadget.